Inside 3D Printing Conference & Expo has grown to become the largest professional 3D printing event series worldwide. 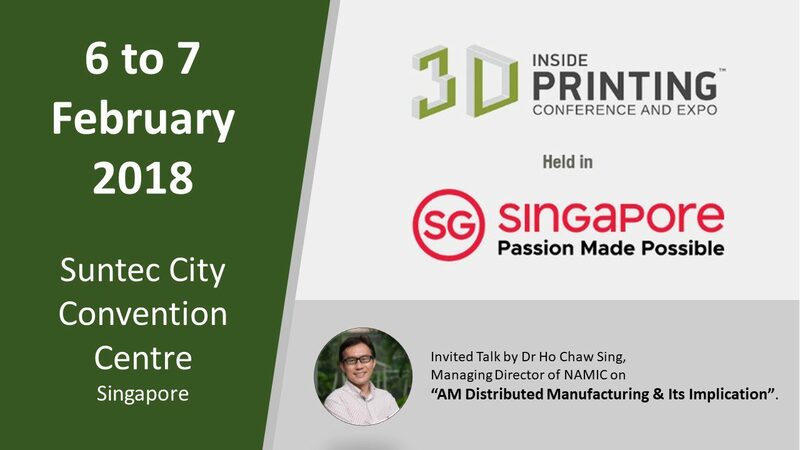 Inside 3D Printing Singapore will feature two days of seminars and exhibitions presenting the latest 3D printing technology & services from Asia and around the globe. Join us in Singapore for fresh new features, valuable networking opportunities, and engaging session topics from top-tier industry speakers. Dr Ho Chaw Sing, Managing Director of NAMIC is among one of the speakers. He will be talking on “AM Distributed Manufacturing & Its Implication”. The event will be held from 6 to 7 February 2018 in Suntec City Convention Centre, Singapore.